During an average summer rain shower (1 inch of rain) your roof may drain over 600 gallons of water across the shingles, into the gutters and down through the downspouts. This stormwater can be collected by diverting your downspouts into rain barrels. Rain barrels help slow the flow of runoff from roofs and other impervious surfaces by storing it for later watering purposes or for release during times when the ground is not saturated. By capturing this water and releasing it when it is not raining the amount of water directly entering local streams through runoff can be greatly reduced. A centuries old technology, rain barrels (or cisterns) can also be of value during times of drought and their accompanying local water restrictions to supply additional water for plants and save money on water bills. There are many styles of rain barrels on the market and they can be found on the internet or at your local home goods or landscaping store. They range from $20 for a do-it-yourself kit to upwards of $200 and in all shapes and sizes. Most are in the 45 to 55 gallon capacity size but for greater storage multiple barrels may be installed in a series. Decide the location of your rain barrel. Often they are placed near downspouts to channel rain water however, you can place the barrel under any surface that has a concentrated flow of water coming off of it. Locate the barrel so it will be convenient to your flower beds and gardens. The barrel must be placed on a flat, level surface, and should be raised off the ground to increase gravity flow and allow you to place a bucket under the lower drain. Concrete blocks, pavers, or a sturdy wooden structure all provide a good base. Be aware, a full barrel can weigh 400 pounds or more. 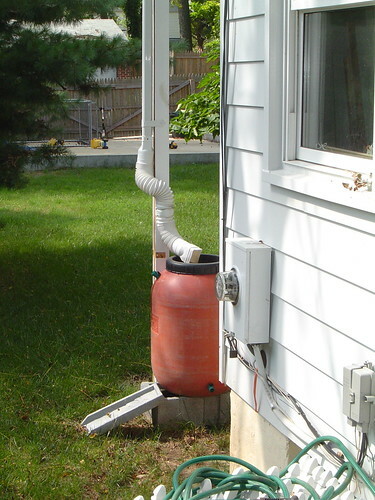 Once the barrel is in place and you are hoping to capture water from the downspout, you will need to modify the downspout so that it directs the flow of water into the screen covered opening of your rain barrel. There are several styles of diverters you may purchase or you can cut the downspout at a height above the barrel and use an elbow to direct it. If purchasing a prefabricated version, pick the one that is best suited for your needs and has the look you want and then, follow the directions. Barrels can be elevated to help gravity provide pressure through a hose and make placing a watering can underneath the spigot easier. Be sure the spigot is closed prior to a rain storm. 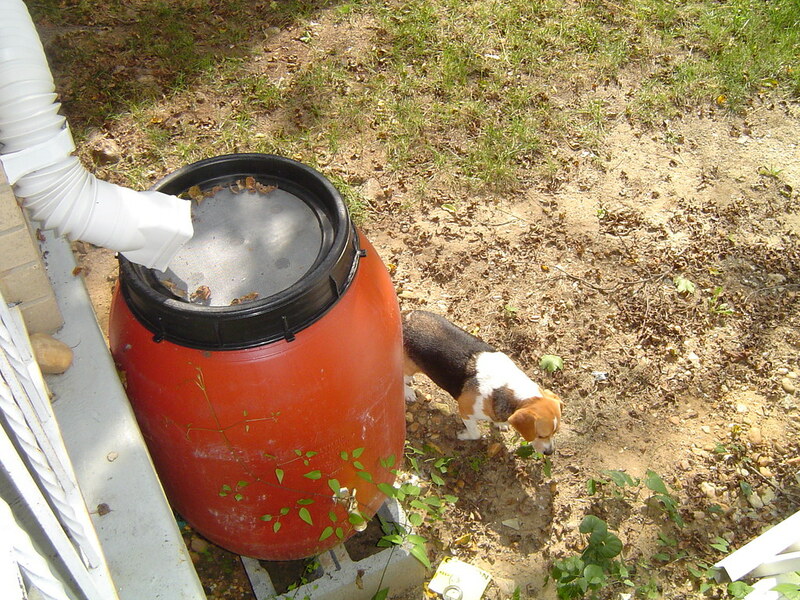 When the barrel fills it will drain out of the overflow line into your garden or lawn. If you continually note a lot of overflow you may consider directing the overflow hose in to a second rain barrel. Once the rain event is finished, use the water as needed, insuring that the barrel will be empty before your next rain event. Clean your gutters regularly. While most rain barrels have a screen over the intake, reducing the amount of leaf litter and other debris from reaching the intake will greatly reduce the amount of debris that makes it through the screen or prevents water from entering the barrel. Visually inspect your rain barrel monthly, preferably when raining to insure fittings are secure and that the screen is clear of debris. In late fall, before the first freeze, fully drain your barrel by opening the spigot and tilting as needed and leave the spigot open. This will prevent freezing water from damaging connections or tubing on your barrel. For longer life, clean and store the rain barrel upside down in a protected place away from wind and snow. Re-install the barrel after the last freeze in the spring. This barrel has a large screen on the top to prevent debris from entering and clogging the barrel.